What is in Nugget's hospital bag? 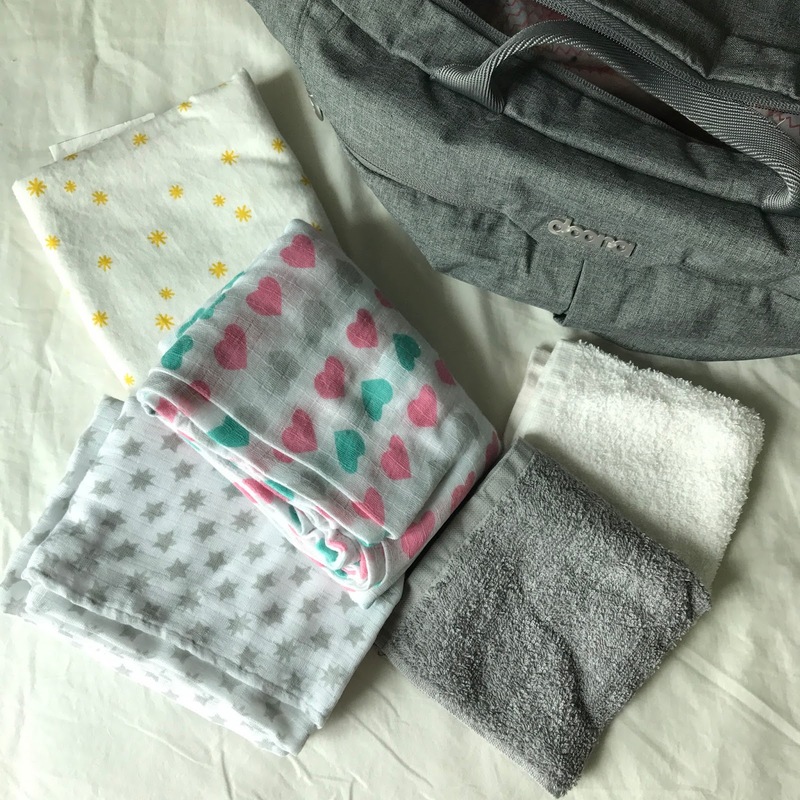 So I got around to put together the hospital bag specifically for the baby. I decided to do a separate bag so no one had to rummage around one big bag to find one particular thing. Plus, I haven't bought everything that I wanted to bring for myself so I'll just sort Nugget's first. It's nice to at least check one of the tasks off the list. As previously discussed, since we bought the Doona carseat/stroller, we ended up getting the All Day Bag in Storm (Grey) as the diaper bag for Nugget. The bag itself is actually quite roomy. 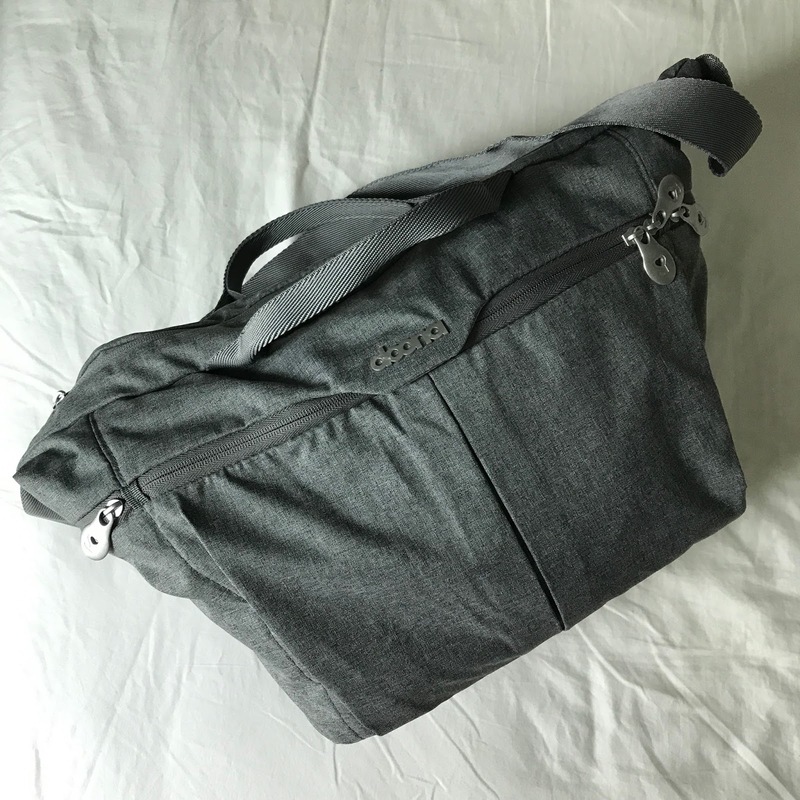 I'd say it's like a small duffle bag that comes with a detachable insulated bottle case and a changing mat. There are two zippered compartment on the sides big enough to fit in a bottle. The zip in front and the top gives access to the main compartment. Then there's another zippered compartment on the back, wide enough to fit in a standard paperback. 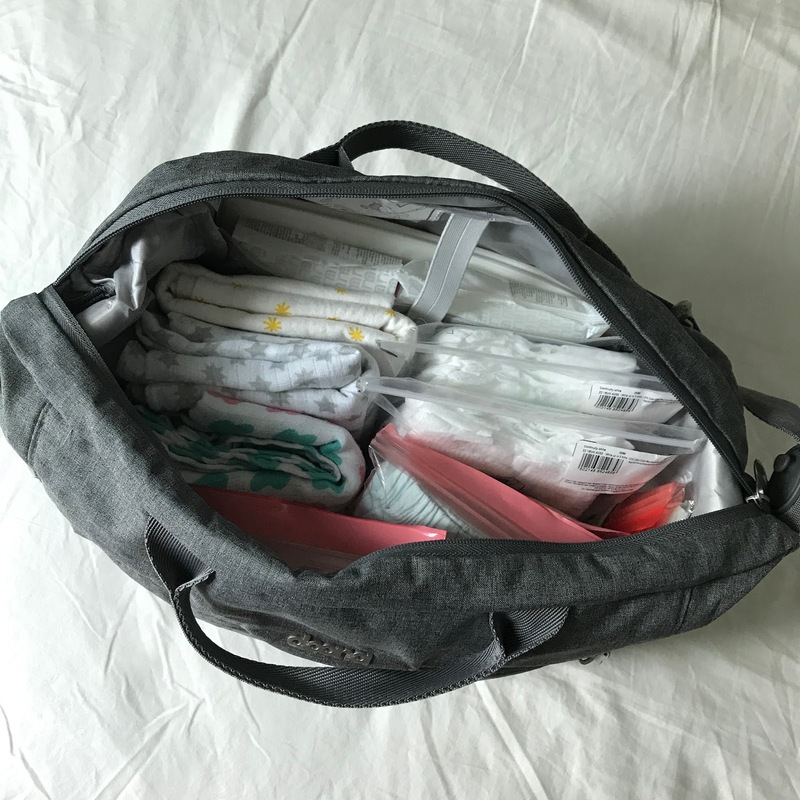 Newborn diapers -- it's probably too much, but I packed ten! Nappy sacks -- because I'm just extra. As for the diapers, there were two school of thought, if I may call it that. 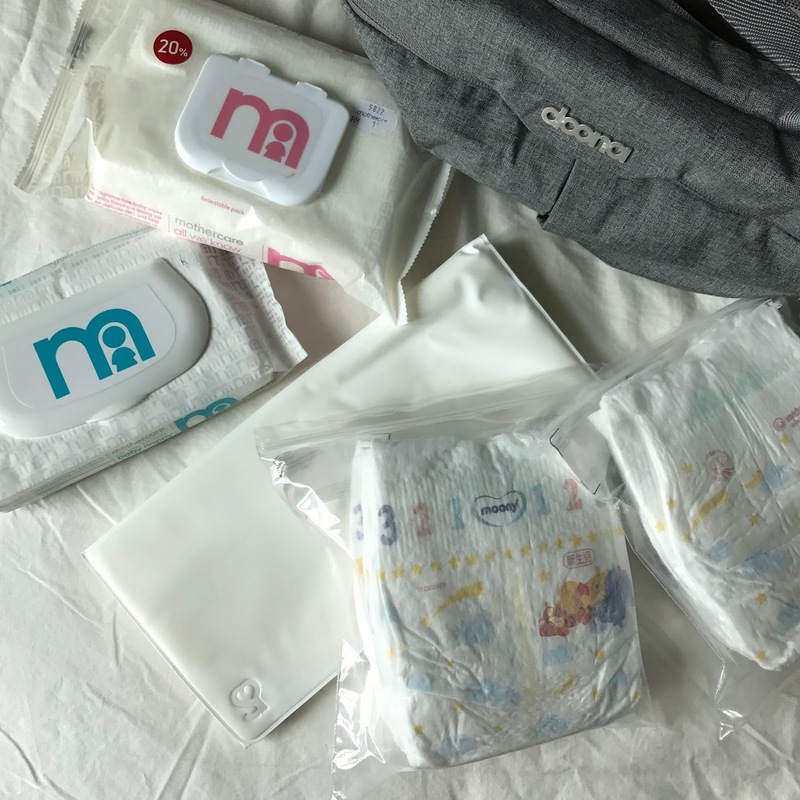 Some told me to just get any cheap brands as the baby will need to be changed every so often, while some told me to get a good brand to prevent leakage -- and having to change them every so often. hahahha! So I got the ones by Mamy Poko. Naturally. A receiving blanket -- soft enough, light enough to keep baby in a nice temperature (hopefully) where it won't be too warm or too cold. Muslin swaddle -- to keep Nugget snug and tight! I have two here in case one got soiled, or I could use one as a nursing cover or to cover the carseat from the sun while in the car. Washcloth -- a couple of them to wipe any possible mess. As I've washed these prior to packing them, I've gotta say that IKEA's brand does NOT wash well. At all. I didn't mind much on the washcloths but the blanket came in a pack of three and they all shrunk into different sizes! hahahaha! 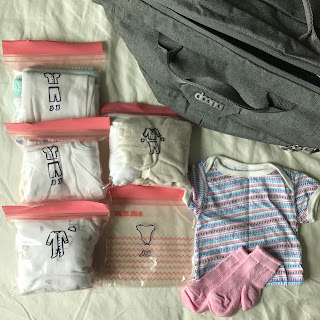 It was annoying and amusing at the same time..
Baby's clothes -- five pairs of them, because.. options! Of course I'm hoping that we won't be in the hospital for too long that we'll need to use all five outfits. As you can see, I've put each outfit into individual ziploc bags and took the time to draw on the bags to indicate what's in it. Yes. Totally extra. But I figured that I won't be dressing Nugget for the first few times. Most probably it's going to be the nurses or Monkey or my mom, so I wouldn't want them to make a mess of things or get frustrated trying to find the right pair of top and bottom. Since my sister in law gave birth a few weeks ago, I found out that nurses would prefer to dress babies in buttoned tops as they are just easier to get into. So I got a couple of basic white tops from Mothercare that are fastened with velcro! Sounds like a breeze, eh? Seriously, I'm glad that I didn't start shopping for baby's clothes so early during the pregnancy..
Now that I've start, I don't think I can stop!! A pack of face tissues, because my mom said to just chuck one in. A couple of ziploc bags -- to chuck soiled washcloths.. or something. It's not like they take much space anyway. A hand sanitizer -- I reckon it'll be useful in some way or another. I'd like to think I've got it all covered -- baby bag wise. I've gone through a couple of checklists on the internet and the one Nina shared with me and I'm pretty sure it's all set. 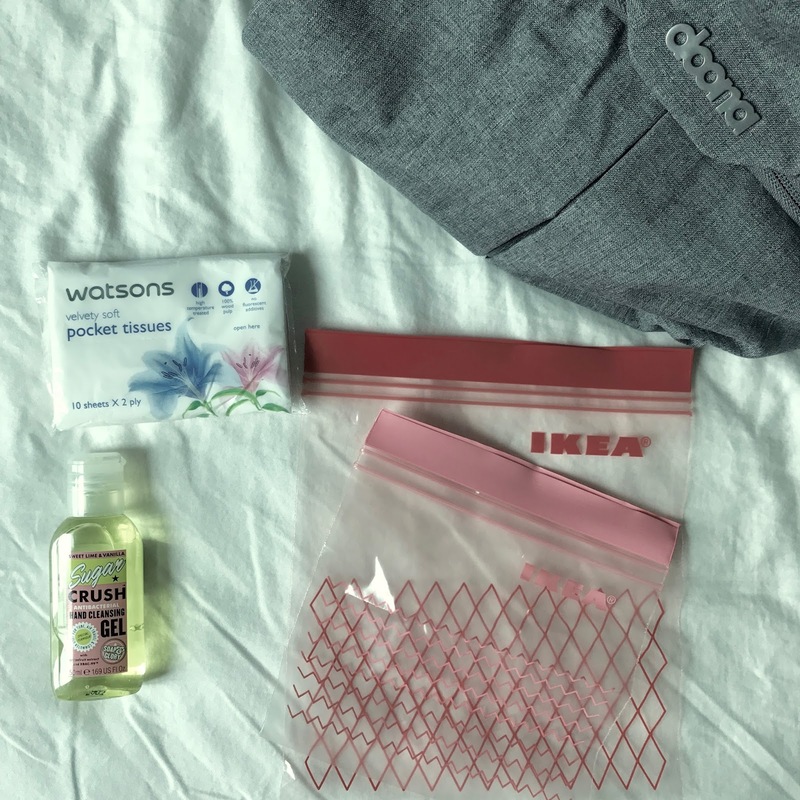 I've cross-checked with my mom and shown her what I have in the bag and apart from the facial tissues, she too can't think of anything else to add. So yeah, I think baby bag is ready! Woop woop! A good compact bag which can hold all the things in one place is a good idea. All things can be found handy in it easy to carry and easy to find.